HARTFORD, Conn. (CN) — A group of energy-efficiency contractors brought a federal complaint Tuesday against Connecticut, accusing the state of illegally swiping $155 million in ratepayer funds to close last year’s budget deficit. “It is ironic that, in the name of plugging a budget deficit, the General Assembly is squandering opportunities for the state’s green economy, hobbling the award-winning Connecticut Green Bank, and defaulting on the state’s commitments to deliver energy savings to the regional power grid, which ultimately will cost electric ratepayers millions in penalties and lost energy savings,” the complaint states. Three high-power firms signed on to represent the challengers: Holland & Knight, in Manhattan; Feiner Wolfson, in Hartford; and the New Haven-based Connecticut Fund for the Environment. The suit takes issue with the bipartisan budget signed on Oct. 31 by Democratic Gov. Dannel P. Malloy. To fill the budget gap, Connecticut’s challengers say, the state diverted to the General Fund $155 million from the Conservation & Load Management, Regional Greenhouse Gas Initiative, and Clean Energy Finance and Investment Authority funds. But the complaint says much of that funding was raised from a small charge on state electric bills, paid by ratepayers to their utility in return for specific services. 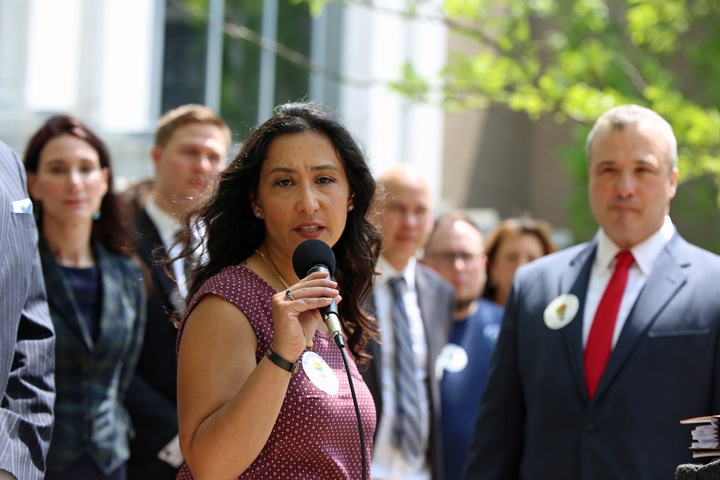 Leticia Colon de Mejias, CEO and owner of Energy Efficiencies Solutions, is the lead plaintiff behind the suit, which she filed with consumer and environmental advocates. Colon de Mejias and her co-plaintiffs were vocal last year about the sweep and warned the General Assembly that they would litigate. Though several lawmakers expressed regret in February that the funds had been diverted, the General Assembly didn’t do anything about it before they adjourned last week on May 9. “These sweeps are wrong and unconstitutional,” attorney Stephen Humes of Hollander & Knight said Tuesday at a press conference outside the federal courthouse in Hartford. Humes said they waited to see if the Legislature would do the right thing and restore the funds before heading to court. He said they also plan to seek a temporary injunction to protect the funds before they are swept in June. The complaint filed Tuesday seeks a declaratory judgment that the action was unconstitutional. As to the $10 million that lawmakers returned to the Conservation Load Management fund, lead plaintiff Colon de Mejias told reporters Tuesday that this was “a bit of a slap in the face with a $2 billion windfall in our coffers for the rainy-day” fund. Colon de Mejas was referring to the unexpected increase in income-tax collections the state realized in April that helped resolve the state’s immediate budget woes. The sweep, Colon de Mejas said, puts energy-efficiency industry jobs and businesses at risk. Her suit estimates that the industry will lose 6,885 jobs in the next two years, and 12,900 homes in 2018 alone will not receive energy assessments, weatherization upgrades, or associated energy bill savings or reduced pricing on insulation. Connecticut businesses will also forgo $31 million in energy-efficiency upgrades that would otherwise provide energy-cost reductions in the millions of dollars. The complaint also estimates that contract cancellations will total more than $126 million, plus about $252 million in private capital from customer investments leveraged from those contracts. Colon de Mejias said the sweep effectively functions as an illegal tax on tax-exempt organizations, such as nonprofits who are ratepayers, because the funding is being used for something other than its intended purpose. As such, the plaintiffs argue that it violates the contracts clause of the U.S. Constitution. Jaclyn Falkowski, a spokeswoman for the attorney general’s office, said they would review the complaint and respond at the appropriate time in court. The Malloy administratio meanwhile released a statement today decrying the diversion of the funds. Although he is named among the defendants in the litigation, it’s worth noting that Malloy was kicked out of the room for the budget negotiations between Republicans and Democrats in 2017, and signed the document with reservations. Mike Trahan, executive director of Solar Connecticut, put the total funds swept since 2002 closer to $400 million. He said they had no choice but to sue the state. At a press conference outside the U.S. District Court building in Hartford, Trahan said every legislative leader is on record saying they didn’t want to have to do this, but they did. “They forced our hand,” Trahan said. Stephanie Weiner, a co-plaintiff who is CEO and founder of New England Smart Energy Group LLC, said they are now seeing the real life fallout of this “misguided, irresponsible decision by the state” to divert funds that weren’t theirs to take. Aside from Colon de Mejias, Weiner and their businesses, other plaintiffs include the Connecticut Fund for the Environment Inc., Fight the Hike, Best Home Performance of Connecticut, Connecticut Citizen Action Group, CT Weatherproof Insulation LLC, Steven Osuch, Jonathan Casiano, and Bright Solutions, LLC. Not all state ratepayers are directly impacted by the sweeps. The lawsuit says customers of municipal electric distribution companies do not pay a Combined Public Benefits Charge or a Conservation Charge. Those companies are Bozrah Light & Power, Groton Utilities, Jewett City Department of Public Utilities, Norwich Public Utilities, South Norwalk Electric and Water, Third Taxing District Electric Department of the city of Norwalk, and Wallingford Department of Public Utilities.